I’m a “throw cooker.” What does that mean? Well, that means I throw stuff together to create good food and teach others how to do that too. It’s pretty simple and just not that hard to do. Folks often ask me to share a ‘recipe,’ which is challenging, because I don’t use them per se. I do try now to ‘throw’ something on paper as a guide because I do love seeing others take my creations and make them… which is what you’ll find below today. So much of what you’ll see from me are concepts… ideas I have in this crazy head of mine I just go in the kitchen to make and see what happens! This gal can’t stand waste so you’re likely to occasionally see me throw something out here with ideas or ingredients that make you go… “do WHAT?” I keep a soup pot in fridge or freezer for soup days, and nothing is thrown out or composted without first pondering whether or not it’s fodder for ‘the pot.’ A perfect example in this recipe is slaw! Lordie, never throw out leftover slaw…. it’s just cabbage, and maybe a little mayo and/or mustard… so what if there’s a little pickle relish in there? That’s just cucumber, a vegetable. Cabbage always adds another layer of flavor (and that’s what we want to do when cooking… add layers of flavor till it tastes good). Folks g.a.s.p. at the sight of seeing me throw slaw into the soup pot… but just about every time there’s some slaw in a soup I’ve made, those are the concoctions that get the biggest rave reviews… so let slaw be one of your secret ingredients too! Like most ‘throw together’ dishes, this chowder doesn’t need meaurements. That’s what THROW COOKING is all about… Cook’n what ‘cha got! And my mission in life is to get those of you who ‘think’ you need recipes outside of your comfort zone and turn YOU into throw cookers! 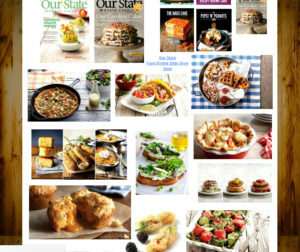 I dream of creating a posse of TC’s across the nation… fearless folks who “cook what ‘cha got” with nary a written recipe in sight! What’s the worst thing that can happen? You mess up one pot o’ food? And that is so RARE, since something can always be done/added/tweaked to make something edible. The exception to this is burnt food… and nothing you do will make that fit’n to eat. As for this Clam Chowder, you can delete any of these things or add stuff (such as carrots or other veggies, other fish/seafood, etc.) to make a wondermous “pot o’ something!” Open your fridge, take a look around at the bits of this and that you would like to get outta the way, and do the same in the pantry. 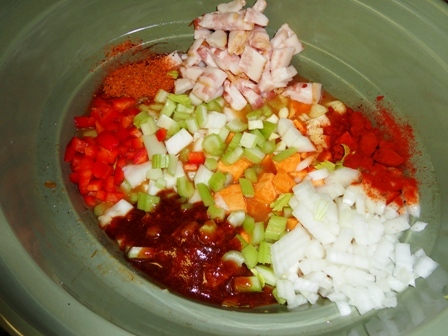 Throw that stuff into your crock pot while cleaning up supper and throw in the fridge. 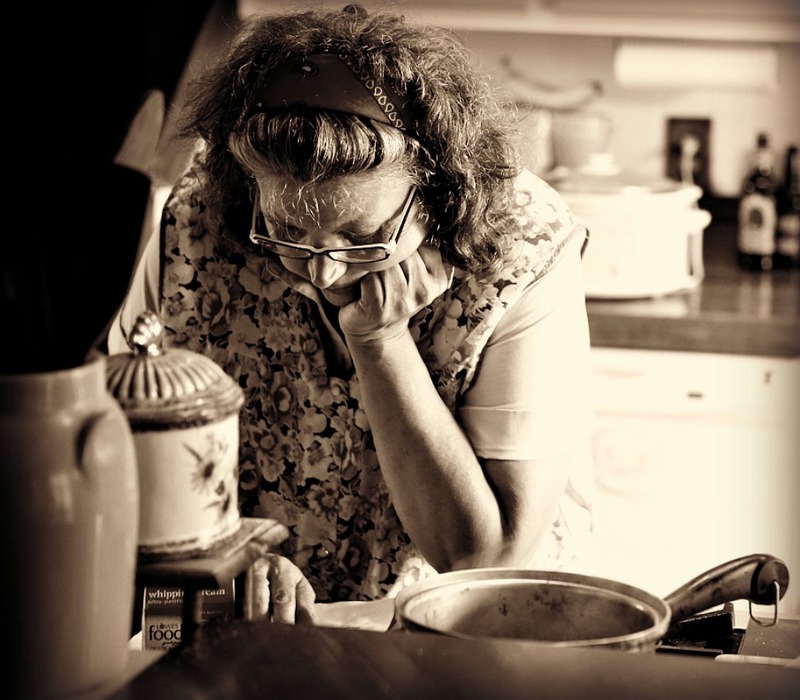 In the morning while your coffee is perk’n, plug in your crock pot, turn it on low and come home to a home perfumed with something mighty good. 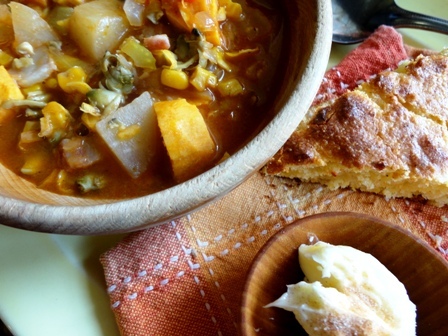 Add a salad (or not), some cheese toast, cornbread, crackers or even Nabs…. crawl into your lounge-y clothes and make your family’s tummies happy… supper’s done in the 15 minutes it took you to throw all this stuff in a pot the night before…. now doesn’t THAT sound delicious!! Feel free to share with credit please. *Be sure to think/shop/buy/support LOCAL folks and your local economy whenever possible! There’s probably a farm near you where many of these ingredients, from the veggies to the bacon, can be had. It’s a ‘good habit’ to get into… thinking ahead a bit and just takes a little “re-programming” a new shopping normal in the beginning, but once you’re there, you’ll remember just how wondermous fresh food from minutes away tastes instead of oceans and continents away! 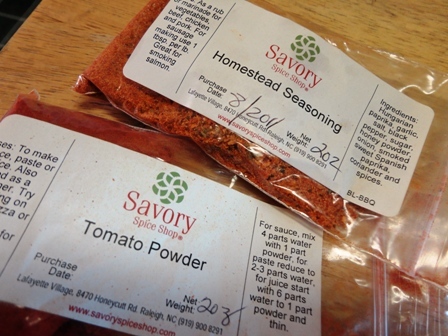 …today, i used some Tomato Powder and Homestead Seasoning from a favorite place to shop in Raleigh, Savory Spice Shop (link below). Other seasonings that work well in chowder are thyme, oregano, Old Bay or just whatever your family likes! Total time from start to eat if done on stove-top… less than an hour! Good old simple food… food the way God meant it to be enjoyed… Nekkid! 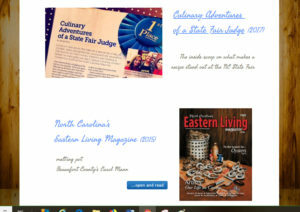 …and the seasonings I used from Savory Spice Shop in Raleigh... drop by and tell Cindy I sent you! See if there’s a Savory Spice Shop near you here! Don’t wait until fall to cook up a pot of this flavorful creamy clam chowder. 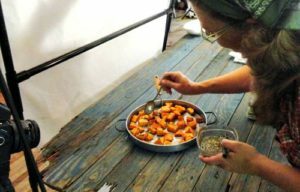 And be sure to fry up a batch of Sweet Potato Hushpuppies to enjoy alongside it too.